Are you tired of having your backyard lack that “wow” factor? Is your backyard not so useful and it is hard for you to entertain unless you get a catering company and hired furniture? 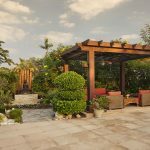 Whether you are looking to upgrade your current backyard design, want to improve a few areas, or want a complete backyard overhaul, landscape design can seem overwhelming at first. Experts at Milestone make these empty spaces useful. Follow these simple tips and we will have you on your way to creating your dream backyard in no time! Even if you have existing landscaping to work with, it really helps to divide your space into functional zones. In order to break the project down for space planning, divide your yard into four distinct areas. 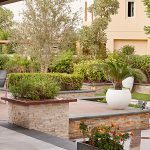 Softscape – vertical greenery and plants that you enjoy along the boundary lines and create privacy , edible herb and vegetable garden and Artificial grass or fresh grass to join useful entertainment areas and fill empty spaces. Entertainment area– a place where your family and friends can gather to relax and play. Every backyard needs plants and greenery to add life to your space. Whether you want to use your garden for planting colorful flowering plants, hide mundane boundary walls with planting, add plants and trees to create privacy from neighbors, grow edible herbs to heighten your culinary exploits or simply want to enjoy the beauty of lush greenery, every backyard would benefit for an area dedicated to growing plants. Not only does it create an environment of harmony, serenity and calmness but gardens add a classic touch of beauty to any backyard. It is so meditative to walk through your garden, enjoying the lovely sight of nature as it grows and flourishes. You can even enhance your softscape with a pond, water feature or fish ponds to add the soothing and intriguing element of water to the area. Softscape creates a very kinesthetic feel to the garden adding natural fragrance and a visual treat. We all need a place to relax and unwind after a long day, and sometimes we want to do that outdoors. Adding a backyard zone completely dedicated to relaxing will not only help you unwind, but it also creates a comfortable space to gather with your family and friends. Start by choosing an area in your yard that is easy to access, nice to relax in and large enough. We suggest adding a pergola or a gazebo to create a distinct space, nice architectural elevation that can add lights, music and fan. Add comfortable seating, with plush decorative pillows and tables for beverages and other items you may need. You can even take it up a notch by adding a fireline, fire pit or outdoor entertainment center! Perhaps you want to create a zen garden, to reflect and meditate. Regardless of how you want to use this space, the idea is to create a place you want to visit in the backyard that provides all of the comforts of indoor living. There are few things more enjoyable in life than enjoying a great meal outdoors with our loved ones. Depending on the amount of space you are working with, this zone can range from a simple dining area to an impressive outdoor kitchen! We suggest incorporating this area close to your home kitchen as it will eliminate the time and distance associated with carrying various items to your outdoor dining area. Pergolas and gazebos provide a great option to create a dedicated and secluded space for outdoor dining. You can even create privacy by adding shade curtains or plants, such as climbing greenery or large hanging plants. For those who love to cook outdoor, you can make an elaborate outdoor kitchen with sink, Pizza Oven, grill, cooking gas, bar etc. Above all else, you want to create a backyard that your family will enjoy! 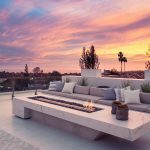 This will vary from home to home but may include adding a firepit for gazing at the stars, a pool and jacuzzi for beating the summer heat, or a custom play area for young children. When creating this area in your backyard be sure to consider what your family will be using it for. Regardless of the size of your backyard, the experts at Milestone can design and build your dream backyard. Stick to these zones and you’re sure to become the envy of the neighborhood for outdoor entertaining!